News from the Tricentennial Committee: ANNOUNCING OUR DECEMBER PROGRAMS AND OUR THEME FOR AN HISTORIC 2019! ANNOUNCING OUR DECEMBER PROGRAMS AND OUR THEME FOR AN HISTORIC 2019! WE ARE DOWN TO THE WIRE ON OUR 2018 THEME -- JUST TWO EVENTS TO GO! 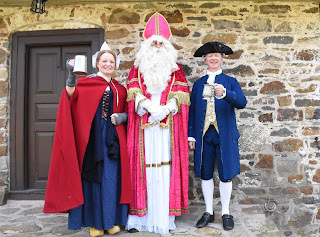 A RARE TALK ABOUT OUR TINY, BUT MIGHTY, RIVER TO OUR NORTH, THE MUSCONETCONG, AND OUR HOLIDAY BASH WITH LOTS OF STUFF HAPPENING WITH FUN FOR ALL AGES! WANNA KNOW NEXT YEAR'S THEME...? KEEP READING FOR THE BIG REVEAL! SATURDAY, DECEMBER 15TH: HOLIDAY FUN FOR THE WHOLE FAMILY! Come with the kiddos or just yourself! 10 AM TO 2 PM: CHILDREN, TWEENS, TEENS (AND YES, YOU, TOO, MOM/DAD) CAN MAKE A BRACELET WITH THE HISTORIC ROPE MACHINE: choose different colors of yarns and make an amazing bracelet to keep or give as a gift! You pick the yarn and turn the crank handle and the machine twists and turns and knits the yarn into a colorful and interesting piece of jewelry! FREE. 11 AM TO NOON: Teacher and Historian Janice Armstrong will be with us for CHILDREN'S HISTORICAL CRAFTS AND GAMES: Corn Husk Toys, Lenape Medicine Pouch and more…. your children can create a toy out of corn husks just like children would have in the 1800’s. They can make their own Lenape Medicine Pouch to fill with tiny treasures. For children ages 6-12 years old. FREE. 10 AM TO 4:30 PM: Meanwhile, adults can shop their hearts content with our annual Holiday sale where we offer blowout prices on merchandise and have items that are classics for holiday gifts. An amazing goody basket will also be up for grabs that day and we will be serving free hot chocolate, lemonade and fabulous cookies and snacks all day. 2PM: MOVIE SHOWING "IT'S A WONDERFUL LIFE": Following our festivities, join us for a special holiday showing of "Its a Wonderful Life" starring Jimmy Stewart and Donna Reed in Frank Capra's classic. "Water, Water Everywhere" indeed! -- this classic film opens up with our hero pondering if his life is worth living on a historical truss bridge over churning water in a small town called Bedford Falls.... The inspiration for this was our very own Califon Borough and their gorgeous, restored historic truss bridge! The villain of the story, Mr. Potter, creates a depressing vision of a residential development called "Pottersville" -- perhaps taken from nearby Potterstown.... Free hot chocolate, lemonade and treats will be available. FREE. Come for the sale, goodies, music and crafts and stay for a holiday classic with deep Hunterdon roots! Our holiday gift to you! Main Branch, Hunterdon County Library, Route 12. Festivities start at 10 am and end at 4:30 pm. No reservations required. We HAVE ALREADY BOOKED MORE THAN 30 TALKS AND WALKS WITH SOME OF OUR MUNICIPAL PARTNERS and we are planning, in total, about 60 walks, talks and events that cover our municipalities' history!! And we have really fun merchandise coming out in our celebration of our municipalities including a new-, Fun Facts tear-off calendar for 2019 - AVAILABLE NOW, "305 Fun Facts About Hunterdon's Municipalities" - at $5 each, it is a terrific stocking stuffer, desk calendar or gift! We also have a new t-shirt coming out that really celebrates our hometowns and hamlets! Expect our (mostly complete) calendar to hit your inbox by mid to late January. It's going to be a really exciting, fun and packed year! TO PURCHASE THE 2019 305 FUN FACTS TEAR OFF CALENDAR, WE WILL HAVE THEM AVAILABLE AT BOTH EVENTS ON DECEMBER 4TH AND 15TH AND YOU CAN FIND THEM FOR SALE AT THE REFERENCE ROOMS AT ALL THREE COUNTY LIBRARY BRANCHES STARTING BLACK FRIDAY. OUR GREAT FRIEND, JANICE GROVER, OWNER OF GROVER GLOBAL FOOD MARKETING IN EAST AMWELL, HAS DONATED FABULOUSLY DELICIOUS ITALIAN COOKIES FOR ALL OF OUR TALKS THRU THE END OF 2018. COME FOR THE COOKIES AND STAY FOR THE LECTURE! THANK YOU, JANICE!! 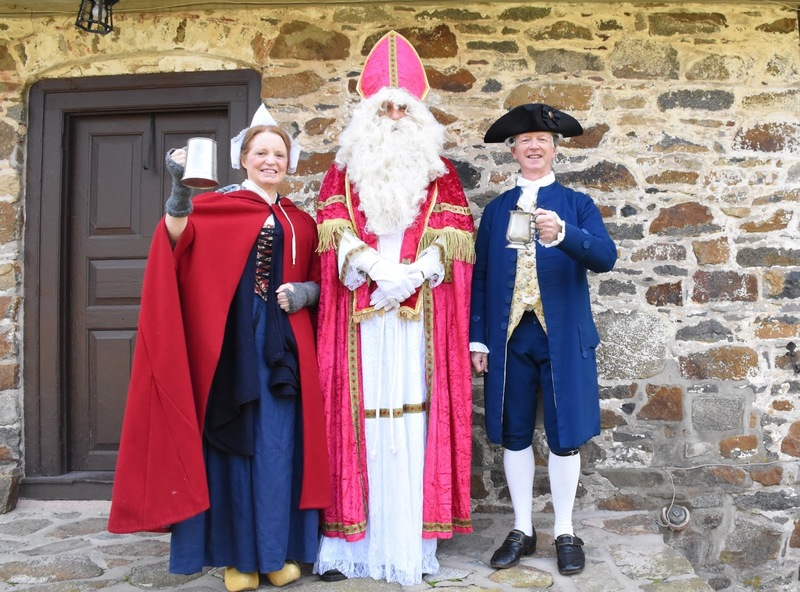 SUNDAY, DECEMBER 2ND: READINGTON MUSEUMS DUTCH CHRISTMAS: Dutch Sint-Nicolaas Day to be Celebrated at the Bouman-Stickney Farmstead, .1pm - 4pm: As a way to honor the Dutch heritage of the 1741 Bouman-Stickney Farmstead, the Readington Museums will be hosting Dutch Sint-Nicolaas Day n Sunday, December 2, 2018 between 1:00 and 4:00 p.m. Sinterklaas will be available for pictures and Colonial musicians, Anne and Ridley Enslow, will perform historic holiday pieces that showcase an historic violin and hammered dulcimer. In addition, historic cooks, Bev Altrath and Arlene Soong will demonstrate authentic 18th century Dutch cooking using the Farmstead’s original open hearth. They plan to make waffles and gingerbread over the open flame. Visitors may also make a pomander ornament to take home, as well as enjoy cider and homemade Dutch cookies. The program is free, but donations are gladly accepted. This Open House Sunday program will be held at the Bouman-Stickney Farmstead, located at 114 Dreahook Road in the Stanton section of the township. For GPS use Lebanon, NJ 08833. This is a free family friendly event, although donations will be gratefully accepted. In case of inclement weather please call the Museums to find out the status of the program. For more information please visit, www.readingtontwpnj.gov or call 908-236-2327. SUNDAY, DECEMBER 2ND: EAST AMWELL TOWNSHIP HOLIDAY HOUSE TOUR, 1pm-4:30pm: Once again, the East Amwell Historical Society has outdone itself by lining up four incredible local homes to present at our 6th Annual Holiday House Tour -- THIS TOUR INCLUDES A SPECIAL VISIT TO THE LANDIS HOUSE IN RINGOES! NOT TO BE MISSED. This year we will start out at one of the largest Victorian houses in the township. This 1850 house has large rooms, high ceilings and will be totally decorated for the holidays. Next we will travel to a restored barn that has large open spaces, big beams, lots of nooks and crannies and beautiful views. On to a 1735 home that was recently featured in Country Sampler magazine. This house, originally a general store, is filled with antiques and historic memorabilia that will surely excite everyone entering through its historic front door. Next stop is the Henry Landis House in downtown Ringoes. This home was on our very first tour and since then every year people have asked to have it on again. Built in 1750, this stone house was at the center of the Revolutionary War and was where General Lafayette recuperated from an illness. You might even see his ghost! Finally after returning to our cars, people will be invited back to the newly opened East Amwell Museum for refreshments. This is the first year the Museum is decorated for the holidays and will have special exhibits of antique Christmas cards, Angels, and Santa’s. You will also have the opportunity of seeing our current photography show by noted local photographer Nancy Parker. And don’t worry, we will have hot cider and refreshments there to finish your tour. Space is very limited and this event sells out quickly. Tickets are $25 per person and seats must be paid for in advance. For reservations, please contact Gloria Wargo by email at gloria.wargo@yahoo.com or by calling her at 908-782-1601. Send checks to EAHS, P.O. Box 98, Ringoes, NJ 08551. Buses leave the East Amwell Municipal Building at 1pm and should return by 4:30. From the Municipal Building, people will drive their own vehicles to the Museum for refreshments. Guests should plan to arrive at 12:45 p.m. so they can be checked in and seated, as the bus will leave promptly at 1 p.m.
What better place to enjoy a Christmas themed Traditional Afternoon Tea than the Joseph Turner House decorated in Victorian holiday splendor. Come enjoy a perfect cup of hot tea along with a wide variety of scones, tea sandwiches and sweet treats. Musical entertainment, Door Prizes and Raffles will be offered with admission. 12pm to 2pm. 117 Van Syckels road, Hampton. $40 per person. Join the Union Forge Heritage Association at our home decked out in Victorian Christmas style and enjoy some food, drink and Holiday Cheer! Professional harpist Mary Cruz of HarpTime will entertain guests by playing the traditional holiday favorites as well as some familiar contemporary tunes. Bring a non-perishable food item, to be donated to the local Food Pantry, and receive a voucher for a free tour of our Museum anytime in 2019! SATURDAY, DECEMBER 15TH: CHIRSTMAS OF OUR FOUNDING FATHERS WITH RIDLEY AND ANNE ENSLOW: Anne and Ridley Enslow return to the North County Branch Library in Clinton at 2pm, where they will sing songs about Washington Hamilton, Lafayette and other founding fathers, talk about Christmas traditions in the 18th century, and of course, end the show with Christmas carol sing-alongs. Some of the program would would focus on New Years and Twelfth Night, which were bigger holidays than Christmas in the 18th century. Free. Reservations strongly recommended. CONTACT: Reference Librarian Dana Neubauer, 730-6135. This new exhibit highlights the radio, one of the most important inventions of the 20th century. A collection of antique and vintage radios is on loan to the Museum from collector and radio enthusiast Michael Molnar, who has been collecting for over 30 years. He has co-curated this very special exhibit which traces the evolution of radio and shares stories of the cultural impact it had on society. For enjoyment, visitors can listen to a radio from over 70 years ago, hearing the sounds of the time. Ever wonder how was radio different from today? Try to tune a radio from a hundred years ago and find out for yourself! Relive the Golden Age of Radio by visiting this amazing collection, currently on display on the 2nd floor of the Mill through March 2019. This exhibition was made possible thanks to funding generously provided by the Astle-Alpaugh Family Foundation. LOOK FOR THE HUNTERDON 300TH'S (almost complete) 2019 CALENDAR EVENTS TO HIT YOUR IN-BOX IN JANUARY!! !